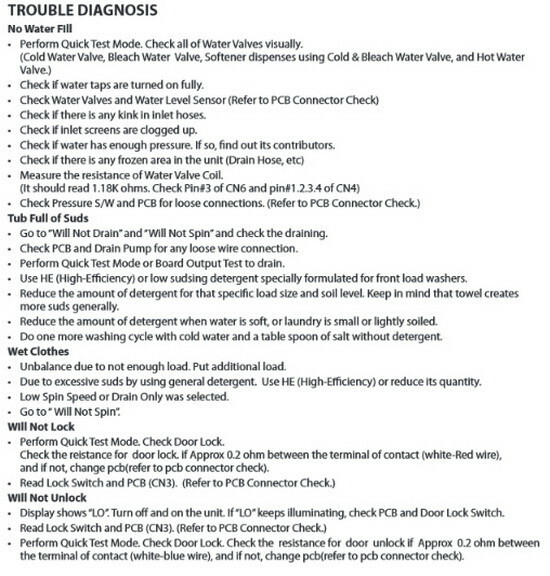 Is your Samsung Top Load Washer WA5471 or WA5451 not spinning, not starting, leaking, getting error codes, not draining, flashing, wrong temp, not filling? 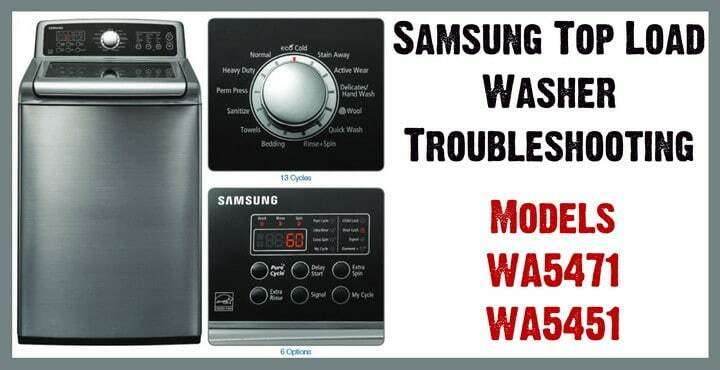 We have all the ways to troubleshoot your Samsung top load washer here. 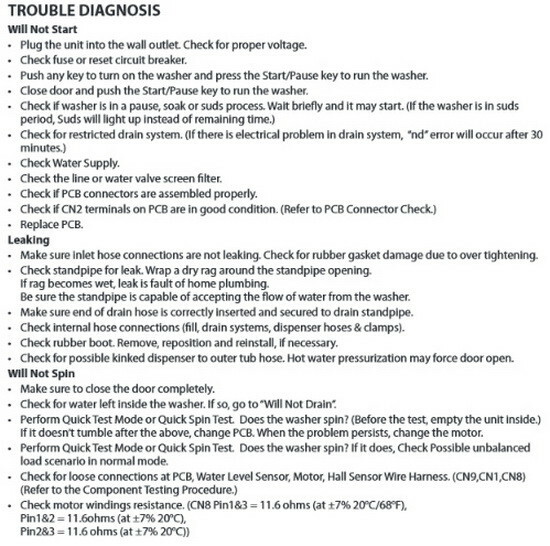 Remember, if you have any questions about repairing your Samsung top load washer, please leave a comment below describing your issue and we will be happy to assist troubleshooting. 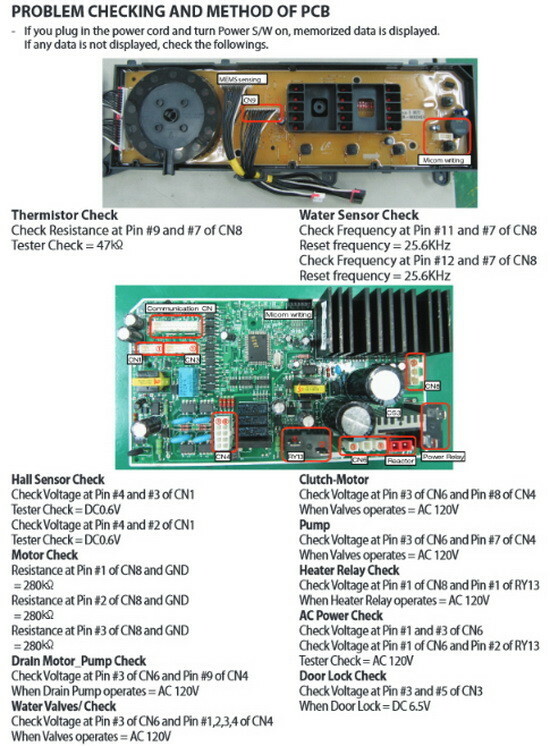 Below are many different troubleshooting diagrams, electrical schematics, water flow diagrams, eeprom check, board input test modes, continuous run mode, fast time down test mode, service modes, error codes, diagnostic test check modes and more. 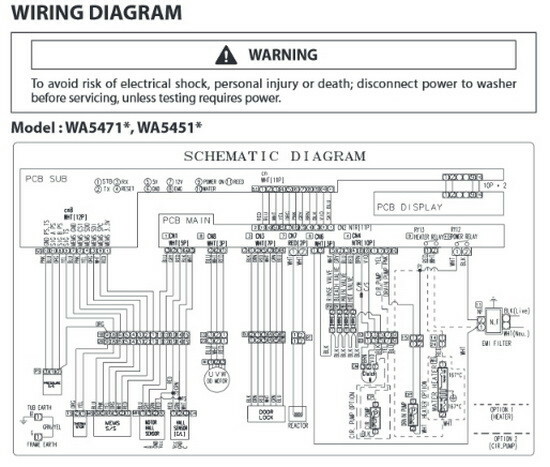 These are meant for troubleshooting on the SAMSUNG TOP LOAD WASHER WITH MODEL NUMBERS WA5471 or WA5451 ONLY. we can help you find the replacement parts you need for less! Haier, Hotpoint, Kenmore, LG, Maytag, Samsung, and Whirlpool washers. 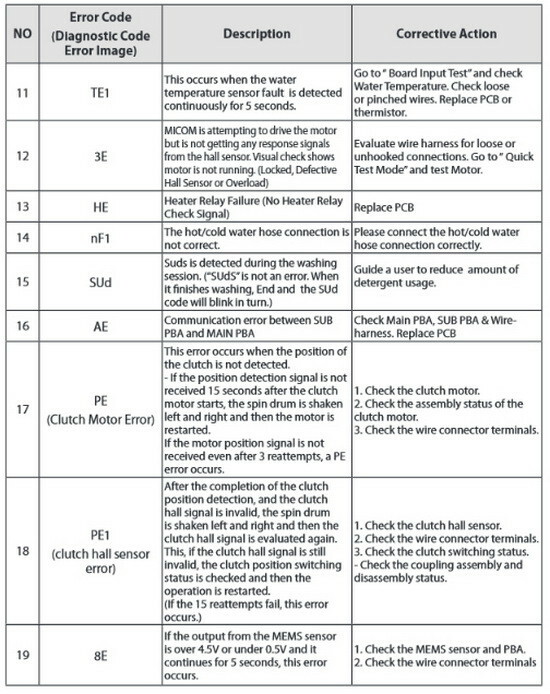 Here are Washing Machine Error Codes For All Washing Machines. Do you have suggestions or questions about your Samsung Top Load Washer? Please leave a comment below. Samsung WA5471 stopped mid cycle when clothes added. Now all it will do on a restart is give the error code PE. I checked the clutch motor resistance and it is at spec. Can this motor still be faulty? Does the first letter of the error code not matter? It looks like a capital E without the top line. I disconnected the water lines and checked and cleaned everything. Everything looks good. Good supply of water with no clogs anywhere. Unplugged for about 15-20. Still doesnt run and shows code. I have a Samsung VRT washing machine, Model WA5471. Washer worked fine and then all of the sudden now it doesnt run at all. 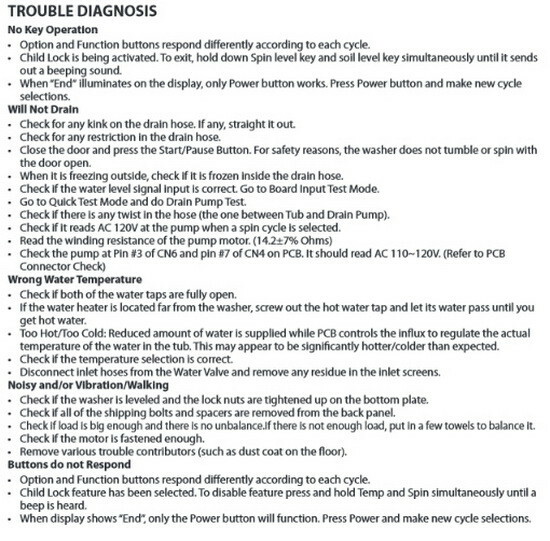 When you turn the power on it reads an error code that I cant find anywhere. It looks like an E without the top line and then E1. Any clue what the problem could be? 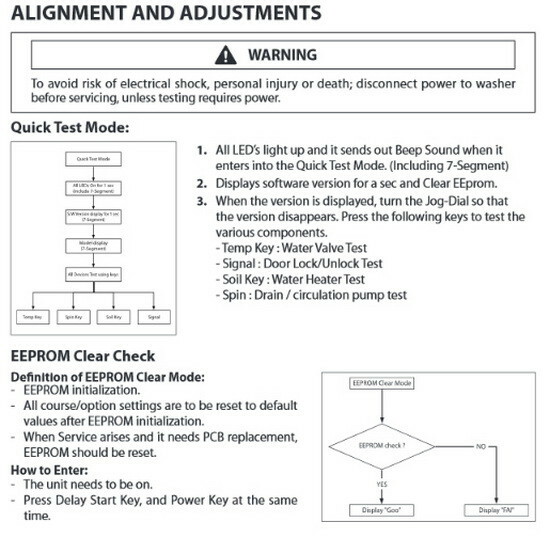 Samsung Washer Error Code E1 means a WATER SUPPLY ERROR. Check to be sure the washer is getting the proper supply of water. Check the water hoses for blocks or kinks, the faucet ON/OFF, and check for a water tube blockage in the washer. After you have that solved, simply try unplugging the Samsung washer for 10 minutes to clear the other error (if applicable). Tengo una lavadora Samsung 5451 y tengo problemas con el desbalance (dc) puedo hacer mi comentario en espanol si o no? graci. Si me contesta terminare mi comentario para pedir su ayuda y sugerencia gracias. Hi! I need to change the light bulb on our Samsung aqua jet VRT washer and I’m not sure how to do that. Can you advise?? Samsung WA5451AN owner here. Foolishly put a single shirt in the washer, then left. So, the machine was off when I got home. The tub is tilted to the left now, seemingly permanently. I have run the machine with a couple of small loads and ran a rinse/spin cycle while empty. The tub won’t right itself. No codes are appearing and it is, believe it or not, washing normally. Research tells me that this machine doesn’t have a calibration mode. That seems to be what is needed! Have a wa5471 with a pe1 code. Replaced the clutch motor and board. What is happening is it will start as if it’s gonna operate but then the clutch motor just starts rotating around and around. What could be causing this after replacing it and the board? I have a WA5471 top load washer and the lid will not stay up when loading and unloading clothes. Is there a tension clip for the hinge. I can’t see what holds it up or if any part of the hinge is missing. Is there a diagram for that part. I appreciate all the informative inforinformation. I have a Samsung WA6L5471ABP/WAS 001 follows washer. I am having problems with my washer not compleying the spin cycle. After rinse cycle it goes into spin for 1 minute. The drum doesn’t spin then it starts to fill with water and starts the rinse cycle again. Please help with any information or advice. Because I have the same issue as yours. Samsung WA5471 washer does not spin. 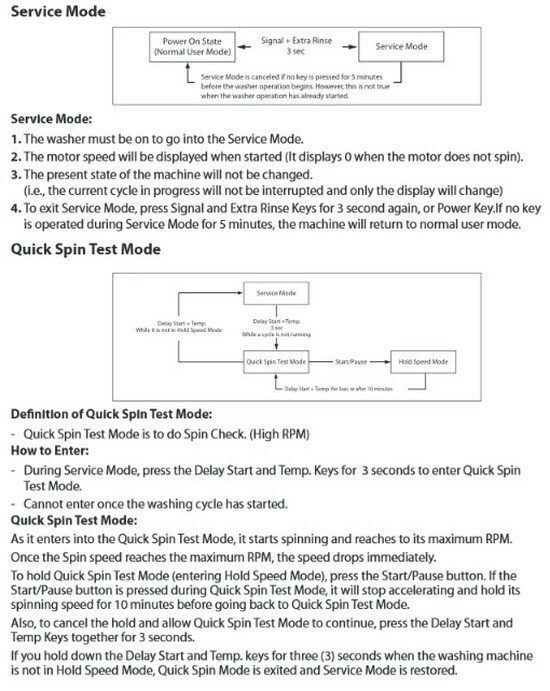 When I enter service mode I cannot perform spin test. I get error code F 35. The first letter is a E without the top vertical line. Every time it comes up with dc unbalanced load open lid move around clothes and start again and it will come up again. I’ve done the spin test and it spins fine with nothing in it. Is there a damper or sensor that tells it it is unbalanced? Troy, did you figure out what was wrong with your washer, as I am having the same issues. It will spin just fine with the spin test, but I cannot get the load balanced. My Samsung washing machine stopped with 13 minutes left on the cycle. It makes a click sound when you try to start it but does nothing. This happened before and I fixed it but not this time. I cleaned the screens and hoses. Thought it was fixed and started a load and now a washing machine full of water and clothes again. Will not drain, checked drain hose. The next step is to get to the drain pump itself to see if it is clogged. I’m not sure if I have the wa5471 or 5451. We have had for over four years but quite a while ago the washer just started making lots of squeaking, especially when it’s just slowly agitating. Clothes come out fine but noisy! Any thoughts on what the issue might be and how to fix? Our washer is leaking just a tiny bit from the bottom at the very end of the cycle. Our model number is: WA56H9000AP/A2. I have a front load Samsung washer. I have had for 1 year it has worked wonderfully up till today. The code UL came up on screen. It did not drain all water and I had blankets in it. Although i had it on a quick wash setting. Nothing different has happened what are your views? 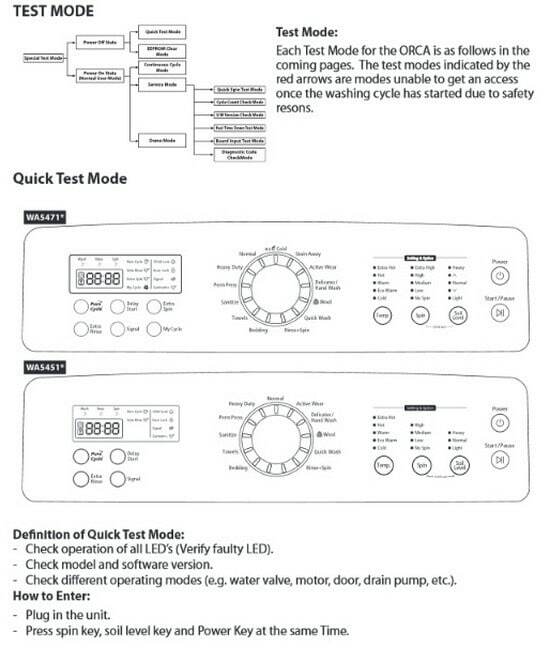 Your washer will display the UE code when it has detected an unbalanced load. Ensure that the load is evenly balanced when using a spin cycle. Items such as large blankets are unlikely to spin properly on their own. Add two additional towels or similar and put on another spin cycle. If the door remains locked and the machine is displaying UE error then RUN A DRAIN CYCLE EMPTY. 1. Whenever I lift the Lid, it stops and I get the code “dC”. Everywhere I look up that code, it says it is for an unbalanced load. But remember, this was a test with no clothes (load) at all, and only minimal water. So for me this code means I opened the lid > ??!! 2. During wash fill, wash itself, rinse fill, and rinse itself, if I open the Lid (machine stops) then close it, the washer starts going again by itself. 3. During all the spins – wash water drain then spin, rinse water drain then spin, and final spin dry – if I open and close the lid, washer will not start again on its own. “dC” code remains. I must press the Start/Pause button then the washer starts at the beginning of the cycle it was on. 4. none of the above spins work. Makes motor noise and tub jerks like wanting to spin, but does not spin. 5. Occasional exceptions, in all spin places, where the spinning does work – even once after this problem started, I remember it completed laundry okay once – starts slowly and builds up. 6. The method in my prior post of going into the service mode (?) did not work the second time I tried it, so that is occasional too. There was supposed to be some kind of lock to prevent opening lid during spins (there never was). Machine just figured out there is no lock, so does not spin. but that does not explain why it “tries’ to spin. or why it seems to struggle to get started for the occasional times it does spin. Maybe tomorrow I will take of the top back cover and see if I can ID the lid lock/sensor. And hot wire it to always think the lid is closed. Found some sensor which was basically a long rod with a rubber protector, which reached about halfway down the tub. Jumped it and no change. So it wasn’t the lid sensor. Never did find that. The problem with no spin is fixed. It was a stretched v-belt. All good for now, Of course I don’t know what caused the belt to become stretched.in the first place. We will see how long it takes for that to happen again. Don’t understand why opening the lid causes “dC”. Don’t even see how the mahine “knows” when the lid is opened. My Samsung washer WA5451 top load is making this squeaking sound in the washer and thumping sound when spinning. No codes show but it sounds like it is coming from the bottom of the metal barrel what can it be? Doubled check to make sure it is level, stuck from there. Check to be sure the wash tub itself is centered. A spring or similar component may have disconnected and is causing the noise when the tub spins. The washer is working properly it just gets tons of pieces of dirt in the wash cycle when it washes & leaves the dirt on the clothes & in the washer. My washer is getting dirt in it while washing – little pieces of dirt. Is there a filter or something that might need cleaned? I have the same problem with mine interested to know if you get yours fixed. And what fixed it? I have a less than 3 year Model Wa5451 Samsung Top loader washer and the compartment where you put the bleach in is rusty all around it. I’ve owned many washing machines and never had this problem. I have a Samsung wa5451 and a quarter got stuck in the agitator. The whole control screen went out and I have no sign of power. I got the quarter out and spun the agitator, but machine will not power on. Do I need to buy a new control board? Have you made sure power is getting to the washer? If so, check the wiring on back. If rear wiring is okay then remove the control board to see if there are loose wire harnesses or possibly a burnt board. It was a burnt out control board. Replaced and it is working again. My Samsung washer is giving the 8E code what does this mean and how do I fix this? 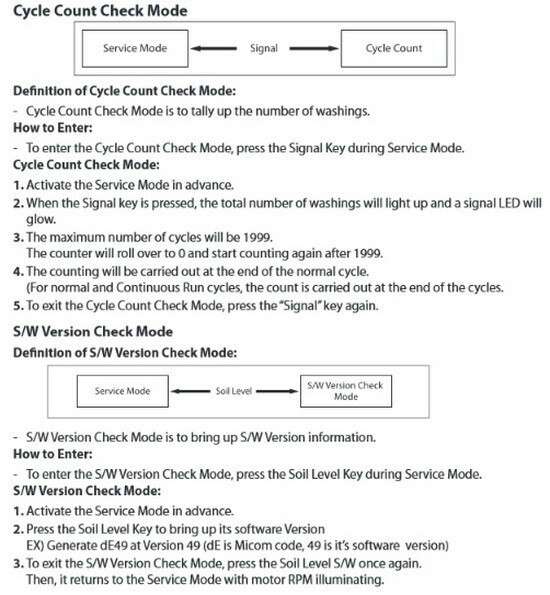 Samsung washer error code 8E means MEMS sensor failure. Check the wiring first to be sure it is secure, if not replace the MEMS sensor. I just replaced the lid lock on my Samsung Washer and now I get a DS error code. What do I need to do now? If your Samsung washer is getting the DS or D5 error code, The washer thinks the lid or door is open or unlocked during the wash cycle. Either close the door, or check that the door switch/lid switch is working properly and installed correctly. My Samsung WA5471 top loader washing machine is leaving a film of lint on my clothes. It never did in the beginning. Also there is a small discharge of water left on the floor on the front left side of the machine. The lint issue may be because of something that was washed earlier and the washer did not wash out all the lint. Try washing empty in “Clean” mode and see if that fixes the issue. If the washer is leaking a small amount of water from the front left, you may have a loose or damaged water line. Check inside the machine to find the leaking hose, connector, or component. Replace parts as needed. I also have a problem with the “gunk” that comes out after every cycle. It is a slimy flaky grey substance. I have tried multiple runs of the Pure cycle with vinegar and tried Affresh cleaning tablets. The stuff just keeps coming. Any suggestions? How often does this happen? How old is your Samsung washer? We understand you say a slimy flaky grey substance… But is the substance similar to oil at all? lLike the oil used to lubricate parts? Is the grey flakes the material that is sprayed onto there inner wash tub? Have a look inside and see if any paint or substance may be chipping off the walls of the washer tub. I have the same problem as David Price!! My washing machine is not very old 2 years. It’s NOT oil but a slimy flaky gray resembling fish food. It’s muddy, dirty feeling when you rub it between your fingers. It’s ruining my whites and makes my clothes smell! I’ve ran four washes with baking soda and vinegar and it’s still appearing!! HELP! I’ve cleaned my entire machine and I have no idea where it’s coming from!! GROSS!! I have the same problem as David Price!! I bought my Samsung Top Load Washer Model: WA52J8700AW about 2 years old. …It’s NOT oil for sure but a some type of flaky gray debris left back at the end of each washing cycle…I’ve ran Pure Cycles with baking soda and vinegar numerous times and it’s still appearing! I also get this grey gooey/flaky gunk, plus a ton of lint left on my clothes after every cycle. I’ve used PureCycle several times in a row and it doesn’t help. Is there a lint filter somewhere that can be cleaned easily? Hello, I have a WA5451, and am getting consistent DC error. I have already replaced the Dampening Rods, and this didn’t help at all. I have read it might be the Hall Sensor? However, I can not find a way to test if that is the problem. If someone could tell me the best way to test, to find out the correct part to replace, would be very helpful! I am waiting with my multimeter, and screwdriver in hand! The DC error occurs when the Samsung washer is unable to spin due to an unbalanced load. In the same manner as to when the UE error occurs, redistribute the items inside the washer and press the Start/Pause button to clear this error. No matter how many times I redistribute (or how over careful I am in doing so), it will not finish the cycle, and get another DC error. Is there a way to test to see if it is the vibration sensor? Or anything else I can do. Ok, I have now replaced the vibrations sensor, and the 4 suspension rods, and I am still getting DC error!!! What else could this be. This machine is driving me nuts! Can you tell us the model number of your Samsung washer? We can assist from there. Is the washer not agitating no matter what cycle you use or how much clothing is in it? I have a Samsung WA5451 and it shows error code 3E. I have checked for loose connections. It will run a full cycle throwing no codes if empty. When I put clothes in the code is thrown again…Any ideas? 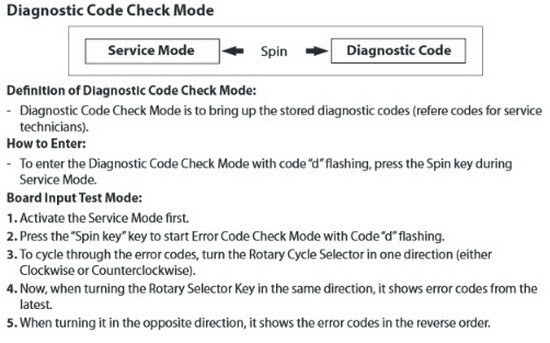 Samsung uses the 3E error code to indicate a drive motor tach fault. Unplug the washer for 2-3 minutes to reset. Samsung top washer, WA5451, upon agitating it has a grinding noise from the bottom of the washer. It went thru an entire cycle. Any thought? You may have a transmission, bearing, motor issue, etc… Safely open the washer up and check inside for what may be causing the grinding noise issue. Let us know what you find. Not really needing to troubleshoot, I need to find a replacement part … the area reserved for bleach in the top loader has rusted out around the cup. The cup is no longer secured to the top, but rests on the inner ring and every load of laundry is full of rusted porcelain confetti. I’m guessing the upper portion all needs to be replaced and I’m trying to determine if that can be done for less than what it would cost to buy a new machine. Are you needing the complete metal top portion of your Samsung washer? If so you can find those parts online. Is the model number of your Samsung washer WA5471 or 5451? WA5471 model washer – aside from the rusting metal above the detergent fill tray it’s been OK up until today. It was running a cycle and then stopped. In official electrical engineering terminology, the smoke was then let-out per the nice smell in the laundry room. The cycle quite on the final “spin” cycle – it just sat at this spot for 10+ minutes before I realized what was happening and shut it off. I can get into service mode and get the spin motor to work, but the tub is still full of water and I can’t get find direction in the service manual to get just the drain motor to work. Thoughts? Next steps would be place a DVOM on the drain motor and verify that it’s getting voltage. I need to check the inlet for a restriction too, but wanted to take the lazy way out first and see if the motor can actually be commanded on. Is the drain motor not getting power/voltage? You should be able to simply select spin cycle to drain the remaining water out of the tub. If you can get into service mode the board is most likely okay and therefore it should let you drain if the drain motor is operational. Not sure if the drain motor is getting voltage or not – I need to verify. With the washer powered on, I can select any cycle and hit the start button – it just sits and does nothing. The timer never counts down, nothing happens with the motors/etc. I can go into service mode and command each individual step and it works with success, but when I select spin cycle, it will only spin the tub and won’t ever drain the water. Sounds like next step is to verify voltage at the motor, and then hopefully replace it – would much rather have a motor failure than a board issue. Fixed. The drain motor was shorted due to the shaft seal failing and allowing the housing to fill with water. The manual that came with my washer had the pin call outs and wire colors incorrectly labeled. Yet another job well done from Samsung. Not sure what more I expect – if they can’t engineer parts I’m certain they can’t properly tell people how to service them. I have a Samsung WA5471. It has started to leave gunk (small pieces of something) in the washer after running a cycle. I have cleaned it, run the Pure Cycle on a regular basis, even run it empty and the gunk remains after each cycle. How do I get it to not do this? It is staining clothes/fabric. Can you explain what type of “gunk” is getting inside the tub and staining your clothing in your Samsung washer? Is it a grease, oil, metal pieces, plastic pieces? Is the washer making noises as it runs like a squeak or a metal to metal sound? 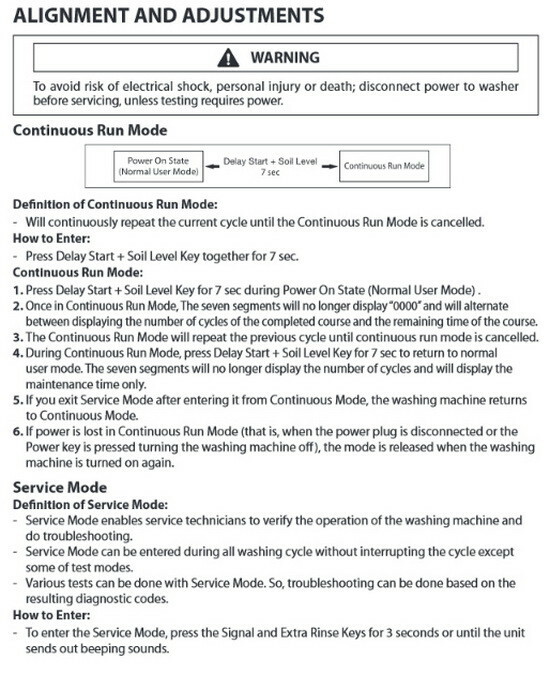 My Samsung washer can’t complete a wash cycle, when it gets to the spin cycle it shut off on error code 8e. the model #wa476dshawr/a1 serial#y4a353bc801670b. IPM fault signal (this is caused by the overload of the MICOM INTO during motor action). If the fault (low signal) happens to be sensed even once during the washing/rinsing stage, the motor stops immediately. Power Switch OFF can clear the overload error. My Samsung top load has started to spin out of control. It stops the spin cycle and fills up with water again. Will do this 3-4 times till it actually finishes. When it spins out of control it really sounds like I put a brick in with the clothes. And ideas? Can you give us the exact model number of your washing machine? We can troubleshoot from there. Samsung WA 5471 water leaks profusely from bottom during the fill cycle. Turned washer up, drain hose was completely disconnected. Replaced it but it is still leaking. There doesn’t seem to be any visible damage to hoses or connectors. I would appreciate any advice you could offer. Thank you! If the drain hose was disconnected and that was causing the water leak on your Samsung washer, be sure it was reinstalled properly and tight. If so… Try to find where exactly the water is leaking. If you cannot visually find the leak while the washer is running… The leak may be either in the water inlet valve where the water hoses connect, or the drain pump may have loose hoses. Check as there are other hoses in the washer that could be loose or may have come off. Let us know what you find. Our washer started displaying the ND error code towards the end of wash cycle a couple of weeks ago. We drained the water bucket by bucket and started on rinse and spin setting without any clothes and it ran OK. We thought it may have been a fluke but it came back after a couple of error free washes and now it happens all the time. Sometimes it just gets stuck and won’t do anything. We have checked the hose and the tip of the area where it connects to the machine but didn’t see any obstructions. Before calling a service person, is there anything else we can try? The ND error code means NO DRAIN. This indicates a blockage somewhere or a part may have gone bad. First, check to be sure the drain hose is not bent, blocked, or crimped. Take the hose off and be sure there is no blockage whatsoever. Check to be sure where the drain hose goes into the wall drain that it is not blocked up. If the drain hose and the wall drain is okay, then check the drain pump itself as it may have some objects in it that may be causing a blockage. If there is no blockage in the draining system, then you may have a bad or malfunctioning drain pump. 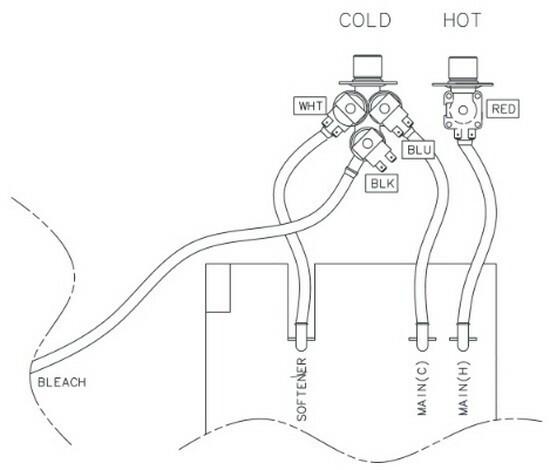 Check power and wire harnesses to the drain pump to be sure it is receiving power and operating as normal. Thank you so much for your prompt response. We have already checked the drain hose for blockage and didn’t find any. We let it drain into the laundry sink instead of wall drain to rule out any blockage there and we still saw the problem. We haven’t checked the drain pump though. Is it a fairly easy task? Could you please provide some tips on how to do that? Checking the drain pump on your Samsung top load washer will involve, unplugging the washer, removing the back panel, and finding the drain pump. There will be hoses connected to the drain pump that will need to come off to inspect the drain pump itself and the hoses for blockage. It will be fairly easy, you just need to slide the washer out to gain access to the back. Turn off water and remove hoses and drain line. See a few videos on YouTube if needed on how to gain access into your Samsung washer. Got a Samsung WA5451 top loading washer in 2012 and it’s been working good since then – except recently it has been getting the nf fault. It starts to fill at the beginning but then it stops and goes around slowly like it does when filling – but it doesn’t fill. I’ve checked the supply, the hoses, the hose screens, the input screens. 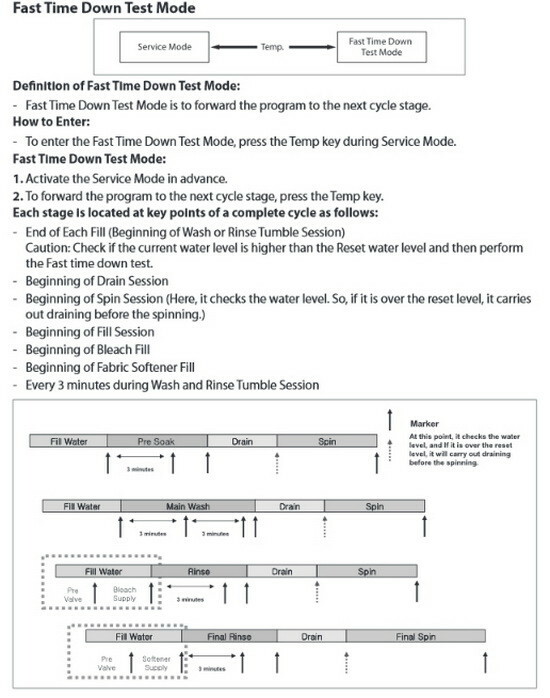 When I put it in the Quick Test Mode and do the Water Valve Test this is what I get. Cold – cold water only. EcoWarm – cold water only. Warm – no water. Hot – Hot water only. Extra Hot – Cold water only. At this point I haven’t checked out the water valve coils. Verify the washer is plugged in and powers on. If it does not power on, check the fuse or reset the circuit breaker. Check water supply valves at back of washer for proper operation, no clogs, and proper voltage. I did check all of those (power, door, filters and water supply. I also checked the valve coils and found the hot water valve coil is open. So I swapped it with the Bleach valve coil (that is good) and ordered a Hot Water valve. Now the washer fills up to about 2 or 3 inches and does the wash. It won’t fill any further than that. 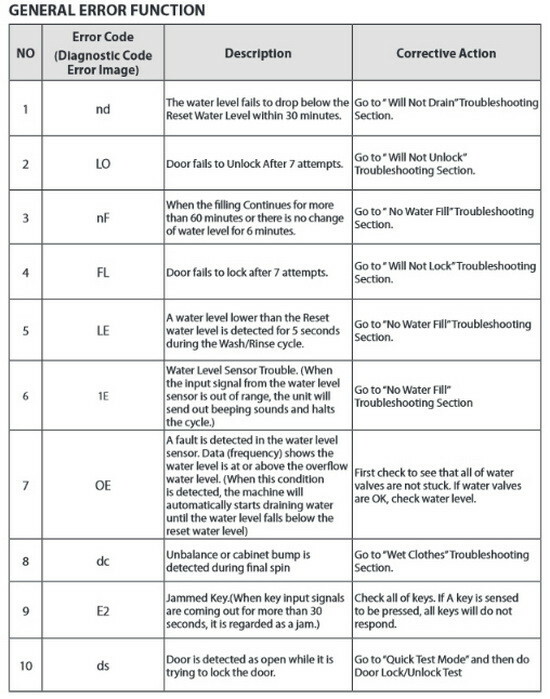 Check the water fill level sensor to be sure it is not clogged or is not malfunctioning. This fill level sensor is what stops the water at the appropriate water level. My Samsung washer will not hold water anymore. I can manually pour water into the tub with a bucket and it immediately flows onto the floor. That would mean the drain hose is not connected or the drain pump itself has an issue. Also check the front drain filter as it may not be connected or missing. Thanks RR. You are correct. It was the discharge hose. It disconnected all on its own. The spring clamp feels very weak. I am replacing the clamp and the other 3 that are similar with screw clamps. I have this top-load washer. It keeps repeating the spin cycle and then finally end up with DC error. We had replaced the Washer Dampers, PCB-Main, Motor Hall Sensor, MEMS sensor, upper harness (DC93-00054C) and lower Harness (DC93-00055C) but the problem kept coming back. I will replace the clutch assembly next. Have tested the procedure to clear the EEPROM (The unit needs to be on, press Delay Start Key and Power key at the same time), IT DOESN’T WORK! It looks like Samsung products are not well tested, they just release to us Beta testers at our expense. I am having the same problem … Hearing everything you’ve tried I’m tempted to pitch it and grab a new machine … any idea what it really is? I finally figured it out, there were 2 issues, the 13 contacts latched upper harness connector was defective from new and the lower harness (broken conductors due to vibration). I swapped each harness out one at a time and the problem would be gone for a couple weeks. Once I swapped out both, everything worked (correctly detect proper load and always complete spin cycle). I think your problem is probably just the lower harness. Very easy to fix, just one screw. Good luck. I have a washer that appears to be leaking from the top? I see water on the floor in the front and back…I took it apart but do not see a true seal?? I took the top ring off and thought there would be a seal there…any advice? When you state it leaks from the top, is it overfilling? Water is too high and splashing over? Too many clothes and water set on high fill? Can you tell us how the washer is leaking from the top? We can go from there. 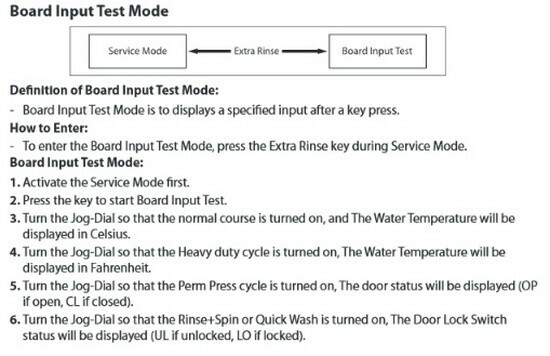 Samsung Washer WA50F9a8D center buttons on control panel are non-responsive. Turns on fine, can adjust cycle using turn dial, and can start and run okay. But can’t adjust water temp, add extra rinse, etc. Need to replace mother board? If so, what is cost and can I do this myself? You may have a wire harness that is loose behind the control panel. Unplug washer, remove screws holding panel on and check all wire harnesses to be sure they are secure. Sometimes the vibration of the washer itself can rattle the harnesses off or they could be damaged. If the wire harnesses are tight, in place, and secure, then check control board for burns or obvious signs of a problem. The board can cost around $190 US dollars. If the board is bad, yes it is something you can replace yourself. Just be absolute sure it IS the board before you buy. Watch a few YouTube videos to see how everything comes apart. 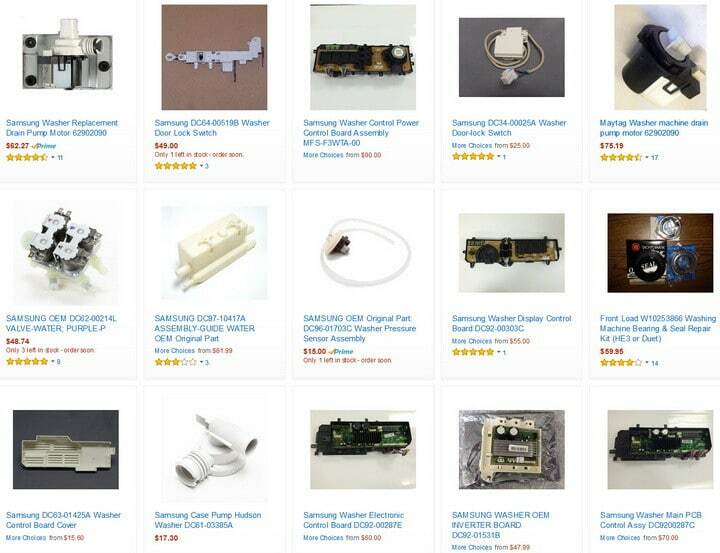 Here is the parts list with pricing for your Samsung washer (all parts for the top control area). MAKE SURE THE SAMSUNG WASHER MODEL NUMBERS ARE THE SAME AS YOURS BEFORE YOU BUY. 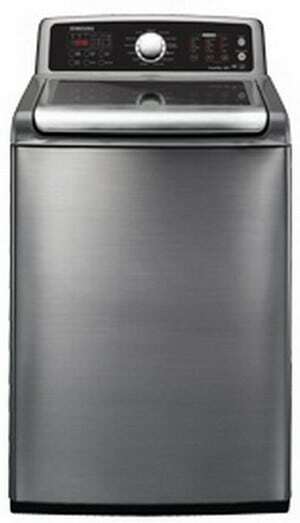 Samsung Wa5451 Top Load washer. We moved it to paint the floor, moved it back hooked it up and now water will not fill. Checked inlet screen and all clear. Puzzled. Please help. May sound too obvious but is water on? Both hot and cold? Water hose crimped? Are connections to washer correct and not crossed? Try using a different cycle and use only cold or hot water and see what happens. Thank you so much for your help. As you suggested, I checked the online tutorials, took out the drain pump, ordered and installed a new pump and it is working now. I appreciate your time and assistance very much.